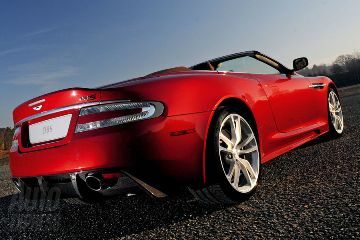 Here are the first official images of the latest Aston Martin, the Convertible DBS Voltante. 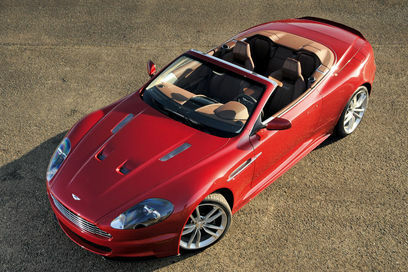 Following on from the success of the coupe, the convertible follows those same lines with it’s retractable fabric hood. With touch button controls that lower the roof in 14 seconds at any speed below 30mph. As with the majority of soft tops, it weighs in slightly more than it’s hard top version due to extra stiffening of the chassis. We are told though that this will not effect the performance, with a few tweaks to the 6 litre V12 power comes out at 510bhp and torque to 570Nm. A six-speed manual is standard, but you can upgrade to AM’s semi-automatic Touchtronic takes her to 62mph in 4.2seconds and topping out at 191mph. Carbon / ceramic brakes bring the Volante back to a halt, while new adaptive dampers, double wishbone suspension, 20-inch alloy wheels and sticky Pirelli P-Zero rubber means the DBS keeps nimple and stuck through the corners. 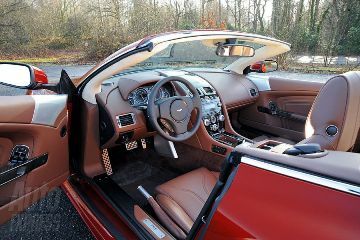 As you would expect the inside is a lap of luxury and includes the latest B & O sound system as standard. Making its debut at the Geneva Motor Show next month, cost is rumored to be around £170,000 – about £11,000 more than the coupe. Thanks to AE and my research skills for the pics!